My neighbor Mitch came knocking on my door today, a little upset. He'd just been to Buster's Shoe Repair Store on Wilshire and found out they were closing down. 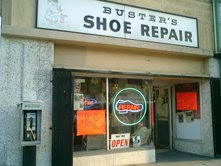 Buster's has been open for over 70 years in that location, with John, the present tenant there for twenty years. Recently the landlord decided he wanted to develop the property (another shopping complex coming our way), so gave John the heave-ho. Twenty years paying the rent, and the guy gets two months notice. Thanks and goodnight. 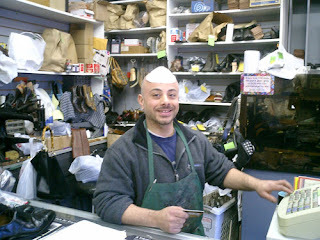 Now obviously, shoe repair stores are not about to become obsolete. People will probably always need a new sole (boy was I tempted to write soul...). But you know, I think small, mom-and-pop stores are on their way out. Who needs them when you can go to Wal-Mart or Costco or whatever and get it all under one roof ? But is that the world we want to live in? Mitch goes into Buster's for a chat more than anything else. He's confined to a wheelchair (and his shoes never touch the ground - so it's not like he needs the service they offer). But he was heartbroken. It's another step in that relentless march towards an homogenized world. I suspect kids in the future (who am I kidding? I bet it's true of kids right now...) will read the Obselidia and marvel at these little stores. "What? All they did was repair shoes and leather and focus on the thing they were experts at?! No way!" Good luck finding a new place where you can afford the rent and the landlord doesn't kick you out on a greedy whim.